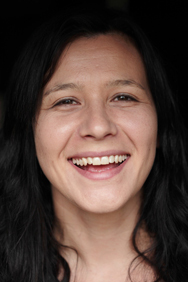 Alethea Arnaquq-Baril is an Inuk producer and film director from Iqaluit, Nunavut, where she was born and raised. She owns Unikkaat Studios Inc., an independent production company, which focuses on producing Inuit cultural documentaries and Inuktitut-language productions. She is a graduate of Sheridan College, and has completed four months of animation training at the Banff Centre. She serves on the Board of the Nunavut Film Development Corporation. 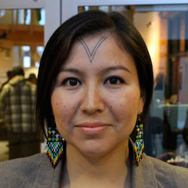 Arnaquq-Baril directed her first film, Tunnit: Retracing the Lines of Inuit Tattoos in 2010, a documentary about her journey to explore the lost tradition of Inuit facial tattoos. It premiered at the 2011 imagineNATIVE Film + Media Arts Festival. Alethea directed the well-travelled Inuit Communications Systems Ltd. (ICSL) short, Inuit High Kick, an Official Selection for the 2010 Vancouver Olympics program. She also directed the NFB animated film Lumaajuuq: The Blind Boy and the Loon, which was named Best Canadian Short Drama at the 2010 imagineNATIVE Film + Media Arts Festival and received the Golden Sheaf Award for Best Aboriginal Film at the Yorkton Film Festival in 2011. Her animated short production Sloth was one of fifteen films selected for Telefilm’s Perspective Canada screenings at the Cannes Film Festival. In 2015 Arnaquq-Baril contributed Aviliaq (Entwined) to The Embargo Project, an anthology of five short films by Canadian Indigenous women. She is currently directing Angry Inuk, a feature documentary set for broadcast on Superchannel. The film explores how Inuit are coming up with new and provocative ways to deal with international seal hunting controversies. Katherena Vermette is a Métis writer of poetry, fiction and children’s literature. Her work has appeared in literary magazines and compilations, including Manitowapow: Aboriginal Writings from the Land of Water. An active member of the Indigenous Writer’s Collective of Manitoba, Vermette was the 2010-2011 Blogger in Residence for thewriterscollective.org, an organizer of the Manitoba Indigenous Writers Festival, and a former student of Joseph Boyden at the University of British Columbia, where she received a Master of Fine Arts degree in the Creative Writing program. Katherena works as a literacy educator, and has recently written a seven-volume children’s picture book series titled The Seven Teachings Stories. Currently, she is completing work on a National Film Board documentary, and a novel, The Break, to be published in 2016. Robert Houle is a contemporary Saulteaux artist, curator, critic, and educator. Now based in Toronto, he is a member of Manitoba’s Sandy Bay First Nation. He graduated from both the University of Manitoba (BA) and McGill University (BEd), and studied painting and drawing at the International Summer Academy of Fine Arts in Salzburg, Austria. Houle has been exhibiting internationally for over 40 years and has taught at the Ontario College of Art and Design University for over 20 years. From 1977 to 1980 he was Curator of Contemporary Indian Art at the Canadian Museum of Civilization. Houle draws upon both Western and First Nations art to address issues of European colonization. He is informed by his dual experiences with Indigenous spiritual practices and the Catholic Church, making use of Aboriginal symbols and ritual objects while combining them with Western sculptural and painting techniques along with text and photographs. 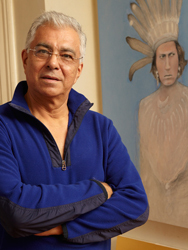 He is the author of several essays and monographs on major contemporary First Nations and Native American artists and has curated or co-curated groundbreaking exhibitions such as Land Spirit Power: First Nations at the National Gallery of Canada in Ottawa (1992) and New Works by a New Generation for the Assembly of First Nations in 1982. His work can be found in the collections of many institutions including the National Gallery of Canada, Art Gallery of Ontario, Winnipeg Art Gallery, Royal Ontario Museum, the Museum of Contemporary Art in Sydney Australia, and the National Museum of the American Indian in Washington, D.C. Among the honours he has received are the 2015 Governor General’s Award in Visual and Media Arts, an honorary doctorate from the University of Manitoba (2014), the Canada Council Residency for the Visual Arts in Paris (2006), distinguished alumnus of the University of Manitoba (2004), an Eiteljorg Contemporary Art Fellowship (2003), the Toronto Arts Award (2001), and the Janet Braide Memorial Award for Excellence in Canadian Art History (1993). In 2000 he was made a member of the Royal Canadian Academy of Arts. Waneek Horn-Miller is a Mohawk from the Kahnawake Mohawk Territory near Montreal. She is a sports commentator for CBC and APTN, an advocate for sport, fitness and wellness, a motivational speaker, and currently serves as the brand ambassador for Manitobah Mukluks, the world-famous Canadian Aboriginal footwear company. Waneek is a graduate of Carleton University. Her prowess in water polo led to recognition as Carleton’s Women’s Athlete of the Year for three years from 1994 through 1997, and she played on the Carleton team that won the OUA championship in 1994-1995 and 1995-1996. In 2014 she was named to the Ravens Athletics Hall of Fame. After graduation, she went on to win a gold medal at the Winnipeg Pan Am Games in 1999 and in 2000 she appeared on the cover of Time magazine as co-captain of the Canadian team at the Sydney Summer Olympics. The Canadian Association for the Advancement of Women and Sport recently named her one of Canada’s most influential women in sport. She served as the assistant chef de mission for Team Canada at the 2015 Pan Am Games, and in 2006 was a torchbearer for Canada at the Winter Olympics in Turin, Italy. In her association with Manitobah Mukluks, she serves as ambassador for the Storyboot Project, a program that supports traditional artists by selling their work for art prices worldwide. She is actively involved in the running of the Storyboot Schools, where the art of mukluk and moccasin making is passed on to the next generation. A six-week Storyboot School was held recently at Carleton. Waneek is a model of perseverance, good-natured humour, and wisdom. She encourages others to follow their own dreams, fight for their heritage, and achieve their full potential even in the face of seemingly insurmountable odds. Andrea Menard is a Métis singer, songwriter, and actor who has released four award-winning CDs. Menard has performed for royalty, prime ministers, ambassadors, governors-general and even sang her song, Peace, to the world’s NATO generals. But maybe even more importantly, she has performed empowering concerts for thousands of Aboriginal youth. She took her one-woman show, The Velvet Devil, across Canada, and received a Gemini award nomination for her performance in the TV adaptation. 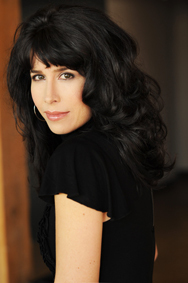 Her jazz symphony show I Am Andrea Menard debuted with the Regina Symphony Orchestra in May 2014. Her latest CD, Lift, which she co-wrote with long-time producer and collaborator Robert Walsh, was recently nominated for a Western Canadian Music Award. Her Métis heritage has a long history of bridging two cultures, and with this CD Andrea has created a collection of songs meant to bring people together. Her first three CDs received multiple awards, in both the Folk and Aboriginal music categories at the Canadian Aboriginal Music Awards, the Aboriginal Peoples Choice Music Awards and the Western Canadian Music Awards. Her TV special, Sparkle, a 70-minute holiday special, garnered multiple Gemini Award nominations. The acclaimed performer has successfully bridged multiple styles by combining a powerful voice, a folk upbringing, a theatrical background, and a glamorous jazz persona, with her Native spiritual teachings. 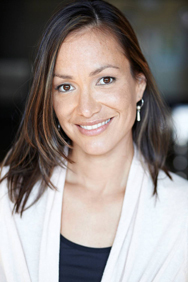 As an actor Andrea has starred in several TV series on APTN and TVO, including Blackstone and Hard Rock Medical, along with award-winning roles in Rabbit Fall, Moccasin Flats, and Wapos Bay. She recently completed filming the first season of the first transgender sitcom, The Switch. And she’s a hell of a jigger.